I can honestly say that I really enjoyed making my clay oven and I would highly recommend you make one yourself. It would make a great project to do with your children, all you need is clay, sand, and maybe some straw, This will easily feed a family of 4/5 . You don’t have to go with the brick cover like I did, keep it simple and stick with clay and make a simple cover. Do something with wood or just throw a tarpaulin cover, or anything to keep the rain off. If you did have a catastrophe, and the oven was destroyed, all you would have to do was mix up the remains with water and build a new one. In the ‘your ovens’ section you will see examples where people have rendered the clay oven. Hey, you could build a new oven every year with the kids. I could easily see you doing this in a weekend. Better still, invite different friends or family members around each year for an oven building party. 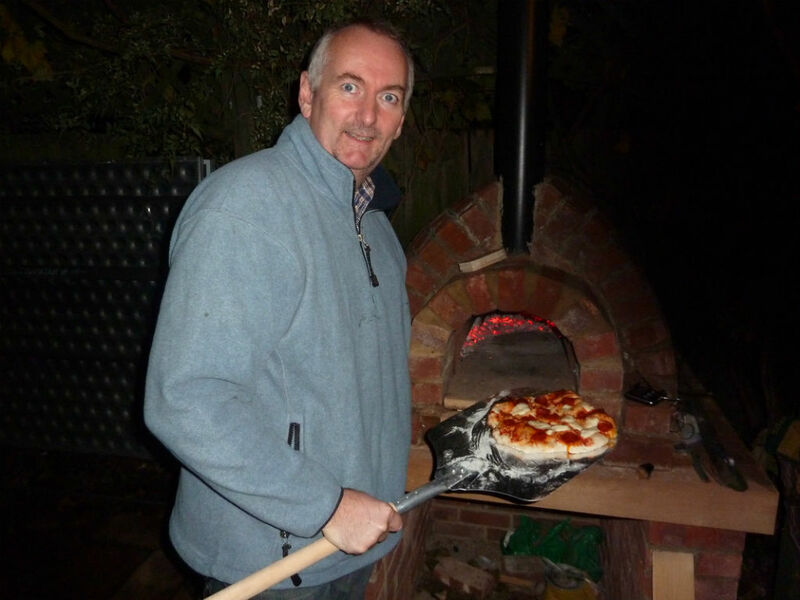 Now if you are going to cook regularly in the oven, which includes big tasks such as Pizza parties or a Sunday roast, then I would not go with a clay oven, but go with a brick built one. Sure I have done pizza parties for 15+ people, but I had to really work at keeping the clay oven at the correct high temperature. Cooking for a family of 4/5 is a breeze, but after that the temperature starts dropping. So make sure it has good insulation. The key point here is “Just Do It”. You have the skills, you just need the will power. Go on don’t you deserve one! If you don’t like cooking, think of it as a piece of art in the garden, or a cool conversation point. After I finished this pizza oven I was already thinking about the next one. I love having the pizza oven, and I had an urge to make a bigger and better one, this time using a different method. The clay oven was fun and easy to make, and I suppose appeals to the primal instinct in you, the back to basics. I think there are more ovens in me, and I will definitely build another clay oven, but the next one I built was a pizza or bread oven with brick walls. There are several you can get as a premoulded oven made of refractory material, which you then insulate and then brick or render over. A nice quick and simple solution. You can also get ovens like the Pompeii that come in a brick kit, also there are great forums giving advice on the build. Want to see what I built, then look here.